Ghost town Calico; silver rush ghost town in California. Photo by Tobias on Flickr (use permitted with attribution / no derivative works). Calico was designated the official state silver rush ghost town of California in 2005 (California also recognizes an official gold rush ghost town). Calico was founded near the site of a major silver strike in 1881 and at the height of its glory claimed over 20 saloons and hundreds of nearby mines. The exact value of silver that was mined is estimated to have been between 13 - 20 million dollars by the end of the boom years. In the mid-1890's the price of silver dropped by over half in value from what it had been in 1880. This caused a loss of demand for silver and by the early 1900's Calico had become a deserted ghost town. Calico was acquired in the 1950's by Walter Knott (owner of Knott's Berry Farm in Buena Park, California). He preserved what was left of Calico and constructed other buildings to recreate Calico's past to serve as a tourist attraction. Mr. Knott donated Calico Ghost Town to the County of San Bernardino in 1966, and today it is part of a 480-acre County Regional Park. 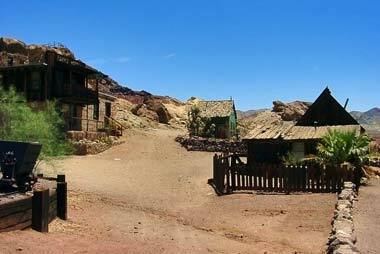 The ghost town of Calico is located near Barstow in San Bernardino county. Prior to its present status, Calico had been designated State Historic Landmark number 782.